Depending on your source, the 12-year American-led nation-building experiment in Afghanistan is at best a fragile work in progress and at worst a bloody, costly failure. But an attractive beige and white edifice in the ancient northwestern city of Herat offers a hint that this troubled, underdeveloped land may yet prosper after 35 years of internal strife and outside intervention. It’s the new engineering school at Herat University, a rebuilt 74-acre oasis of relative tranquillity in a region still plagued by insurgent violence. Inside modern labs and classrooms built around a soaring, skylit atrium, 900 students are enrolled in civil engineering, architectural engineering, and mechatronics courses revamped and streamlined by University of Hartford professors, who also provided master’s-level training to many of the school’s 20 engineering faculty. The Hartford-Herat collaboration is an important engineering component of efforts by universities in the United States, Asia, and Europe – with millions of dollars from national aid agencies and the World Bank – to expand and modernize higher education in Afghanistan. Starting with a 2006 partnership among Nangarhar University, San Diego State, and Rotary International, the World Bank’s effort reached 12 universities by 2010. Overall, strides made in Afghan higher education have been considerable, given that two-thirds of the nation’s population is illiterate and girls were barred from school under the Taliban. Since 2001, when U.S. forces invaded following the September 11 attacks, student enrollment has multiplied 12-fold, from 8,000 to 100,000. Girls’ postsecondary enrollment has gone from zero to some 19,000; women now make up 16 percent of total faculty. And more than 65 private institutions of higher education have been licensed by the Ministry of Education. Engineering, essential to development and to human well-being in so many ways, from roads and electricity to water and sanitation, is one of the leading pursuits, along with English, computer science, and business. Some 400 miles east of Herat, Kabul University’s engineering program – the nation’s first – is being restored and sustained with help from Japan’s Nagoya Institute of Technology, the Tokyo University of Agriculture and Technology, the Japanese government, and other donors. Ten of the school’s engineering faculty are studying for graduate or postgraduate degrees at the two Japanese universities. Other Afghan universities that have seen significant investment in engineering programs are Nangarhar, Balkh, and Kabul Polytechnic. Herat’s revival owes much to the persistence of a Hartford professor of civil and environmental engineering, M. Saleh Keshawarz, who has been active in efforts to rebuild the engineering program for more than 20 years. In 2002, the university and its engineering college were struggling. With no money coming from the nation’s interim government, a local relief agency, Coordination of Humanitarian Assistance, with funding from a Dutch charity, helped keep the school going, and it asked Keshawarz, who had been active in the country’s reconstruction, to help to fix the program. Keshawarz, 60, a 1978 graduate of Kabul University who earned advanced degrees at U.S. schools, was unsuccessful when he initially turned to the U.S. Agency for International Development and the Asian Development Bank for funds. In 2006, he decided to apply for funding from the World Bank’s Strengthening Higher Education Program (SHEP). That October, Keshawarz and two of his Hartford colleagues – Ivana Milanovic, a professor of mechanical engineering, and Hisham Alnajjar, a professor of electrical, computer and biomedical engineering – journeyed to Herat to assess what the school needed. Keshawarz reworked Herat’s five-year degree into a four-year one, in part by stripping away a requirement for six months of on-the-job training. Herat offers three majors: civil engineering, architectural engineering, and mechatronics. This last was Alnajjar’s idea. While there was a need to graduate both mechanical and electrical engineers, Herat wasn’t ready to support two new programs. Mechatronics combines the main aspects of both majors into one, Alnajjar explains. “Both the ministry and the university liked that it saved lots of money.” Edris Naseri is head of the mechatronics department, which now has 35 students, including seven women. The first of them, 11 in all, will graduate this spring. Naseri is optimistic that his department will grow. “I think we will have more students when our graduates go into the market and get jobs,” he says. The Hartford team also realized that since most of the engineering faculty at Herat had only bachelor’s degrees, there was a big need for them to obtain master’s. Distance learning was not an option because there were no Internet connections back then. With the help of Beth Richards, a rhetoric and writing instructor who also constructs English writing courses for Hartford engineering students, the academics put together a SHEP proposal aimed at covering the costs of retraining Herat’s faculty. Richards made two trips to Herat in 2008 to assess the state of the engineering school’s English-language programs. Engineering courses are taught in both English and Dari, so students need strong English skills. The faculty’s “English skills were quite good,” she recalls, but their students’ abilities “varied wildly.” Some had had seven years of English lessons and spoke and wrote fluidly; others could do little more than recite the alphabet. She had to quickly develop methods and materials to help the faculty deal with such a wide skills gap. Richards also got Herat’s English professors to help develop, refine, and expand the materials she had cobbled together. Today, Herat’s engineering college is brimming with modern lab and computer equipment, and has video-conferencing capability. Once the Internet connection is more robust, it will have distance-learning facilities. Dean Moain says there are plans to expand the college beyond the current three disciplines, and he wants to increase the enrollment of women. But, he admits, female graduates face a tougher job market. “Because of the difficult security situation, they cannot work outside the cities, and in the cities the [job] markets are fuller,” he says. One reason that 35 percent of the architectural engineering students are women is that the discipline’s geared toward urban development. Another hoped-for big step is to establish a master’s-level graduate program at the school. Kabul University was, in its 1970s heyday, the destination of choice for aspiring engineers from throughout Afghanistan. It drew elite students as well from neighboring India, Pakistan, Iran, and other corners of Central Asia. The Kabul U.-Japan connection began at about that time with an amateur Japanese wrestler, Kenshiro Matsunami, who briefly taught there; he later went into Japanese politics and became an early supporter of Afghan causes. But a 1978 revolution, followed by the Soviet invasion, civil war, and Taliban rule, left the campus in such ruin that in 2002, students rioted over food and power shortages. Critical to this rebound is Japan, second only to the United States as an Afghan donor. Constitutionally barred from sending its military into combat roles abroad, Japan has focused on nonmilitary and humanitarian programs like election monitoring, infrastructure building, and especially education. Since the fall of the Taliban in 2001, it has contributed $5 billion to postconflict reconstruction. As educational ties between the two countries have expanded, Japanese aid has shifted from just supplying computers and lab equipment to upgrading the quality of the faculty. Of the 20 KU faculty members pursuing graduate or postgraduate degrees abroad, half are based either at Nagoya Institute of Technology, in central Japan, or at the Tokyo University of Agriculture and Technology, under long-term scholarship programs for master’s and doctoral students begun in 2005. Altogether, hundreds of Afghans are enrolled in engineering and other postgraduate programs at dozens of Japanese universities, under the two-year-old Promotion and Enhancement of the Afghan Capacity for Effective Development (PEACE) program. Japan aims after five years to have subsidized master’s and Ph.D. degrees for a total of 500 Afghan civil servants and university faculty, primarily in engineering and agriculture. A decade ago at KU, advanced degree holders were practically nonexistent; now nearly all of its teaching staff hold at least a master’s degree. KU plans to add a fifth department, energy engineering, to its existing architecture, civil, electrical-electronics, and mechanical engineering programs. Female enrollment remains extremely low at KU: Only 36 of its engineering students are women, or about 5 percent. That’s a legacy of the Taliban. During its rule, no female student or faculty member dared set foot on campus. Personal safety remains a prime concern for KU’s female students. In a country where even traveling by car is a calculated risk, “desk jobs” are the default preference for females. “Mostly women are not interested in studying engineering,” Dean Layan says; they opt instead for law, literature, or journalism. However, he insists, “we’re trying to attract more.” His sales pitch to wary students and their parents is that not all engineers end up hiking through rugged countryside but can also have comfortable – and safe — positions as designers in offices. Fatema Samin, 27, a database officer with the Afghan Ministry of Energy and Water who has just started a master’s program in civil engineering at Tokai University, is researching Japan’s extensive experience in quake-proof design to publish a new set of codes. These would be an Afghan version of AASHTO (American Association of State Highway and Transportation Officials) standards for infrastructure design — customized to her native country, part of which also sits on a geologically active zone. Fellow student Najibullah, a mining engineer who said he had dreamed of visiting Japan since childhood, is studying the properties of a sedimentary soft rock called diatomaceous mudstone. “We can use it in many things, like herbicide and fungicide,” he explained. The substance also signals the presence of oil and gas. If Afghanistan’s future political stability is a question mark, the rebuilding effort seems sure to provide a stable job market for engineers. “Our graduates are very busy,” says Herat dean Moain. 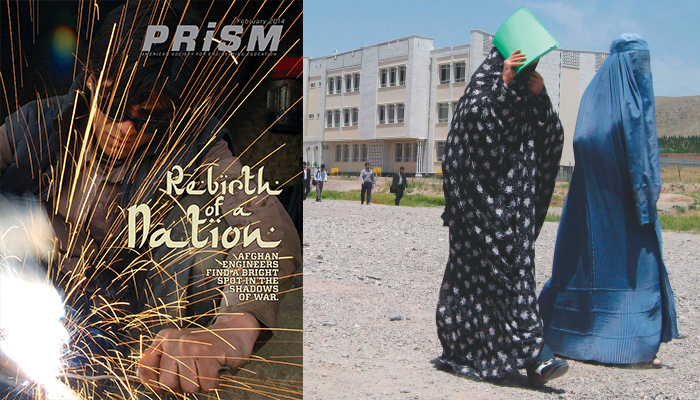 His counterpart in Kabul, Layan, says engineering students are wooed by employers well before graduation. “Presently, there is a big need for electrical engineers,” to plan utility development and run IT systems, he says. Accordingly, engineering is one of the country’s few high-paying professions. Salaries range from $800 to $5,000 a month — jaw-dropping amounts of cash in a country where average per capita income is $570 a year and where 35 percent are unemployed. Unsurprisingly, Keshawarz says, “it’s very competitive to get into the engineering schools.” Kabul’s engineering school, for example, attracts more than 15,000 applicants a year but accepts only a few hundred. Private colleges of engineering are working to pick up the slack. They mimic the curricula of Kabul and Herat, use labs made available to them by engineering-talent-hungry consulting firms, and rely heavily on moonlighting faculty from the universities. Thomas K. Grose is Prism’s chief correspondent, based in London. Lucille Craft is a freelance journalist and broadcaster based in Tokyo.